Evaluating and processing your images on a non-calibrated display is simply a bad idea. Each display shows colors slightly (or significantly) differently and each needs to be calibrated to a standard. Using a hardware calibration system such as the Datacolor SpyderX Pro & Elite Display Calibration Systems makes fine-tuning your displays easy and precise. Until recently, I had been using the Datacolor Spyder5 Elite Display Calibration System. The Spyder5 worked great and I admit that I was not anxiously-awaiting the next version. What could be improved enough to warrant my attention? How far has color calibration technology had progressed in four years, since April 2015 when the Spyder5 series was released? Accepting the SpyderX Elite evaluation unit would obligate me to commit the time required to complete a review, but in this case, that time spent may prove to be offset in the long run as a headlining feature of the new color calibration system is significantly reduced calibration time. And considering there never seems to be enough hours in the day, I greatly value products that allow me to work as efficiently as possible. Installing the Datacolor SpyderX (any version) is simple. Download the SpyderX software from the URL included in the box and install it. Then plug in the hardware colorimeter device and then run the SpyderX software. After validating the software with the provided serial number, a wizard walks the user through a series of steps as shown below. Click through each step as most are self-explanatory. I'll then review some of the steps below. Note that displays should be fully warmed up (at least 30 minutes) before being calibrated or used for critical image processing. Step 2 shows suggestions before beginning the calibration process. Note that in addition to the monitor warm-up requirement, you should reset your monitor to its factory default state and then disable the hibernate feature (if available) and any other features that influence the monitor's color such as NightShift, TrueTone, Night Light, etc. Make sure that no direct sunlight is hitting the display (also a good suggestion for editing) and, if you can, run the calibration in a relatively dark environment with overhead and nearby light sources turned off or otherwise covered (e.g., windows shaded). In Step 3-6, information on your specific monitor and its features is input so that the software can determine the optimal calibration process. 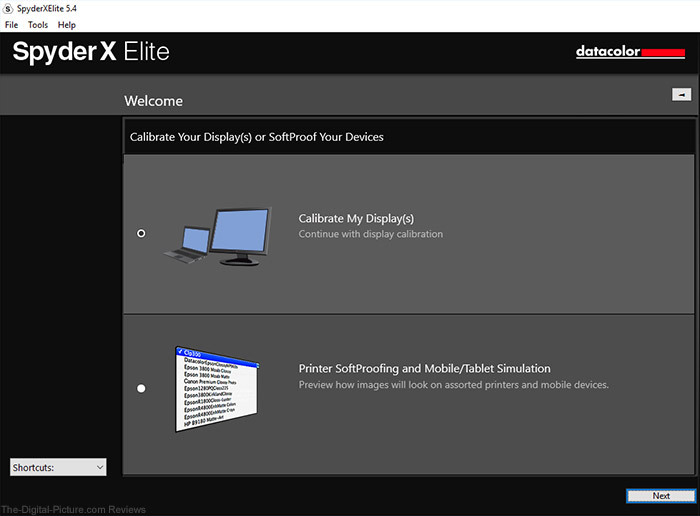 In Step 7, a step-by-step walkthrough for calibration of a single display can be selected with an interface tailored to matching various monitors or the expert console. For most photographers, the Step-by-Step Assistant will be the go-to option. Step 8 allows you to specify the type of calibration desired – ReCAL[ibration], CheckCAL or FullCAL – as well as your preferred monitor settings (most should use the recommended settings, at least at this point in the process). Depending on your monitor's feature set, Step 9 may or may not appear identical to the captured screenshot, as it may advise for different settings adjustments. For Steps 10 and 11, the SpyderX colorimeter is used to measure the ambient light in the display area. Many displays will need to have their brightness adjusted to a very low level if being used in a dark environment. Note that after its analysis, the software recommended a different white point than the default recommended value selected above. At Step 12, the Datacolor SpyderX colorimeter is hung on/against the front of the display within the outline provided by the software. A counterbalance weight allows the device to hang suspended. Note that the position of this weight on the wire can be adjusted for proper balance for the setup being calibrated. For Steps 13 and 14, user intervention is required to set the monitor brightness to the recommended level. After an adjustment, clicking the Update button captures a new brightness measurement. The caption advises you to set your monitor's brightness level to within 4% of the recommended value. To alleviate you from having to get out your calculator, the highlighted area below the recommended/measured results indicates the acceptable range. Not shown in the screenshots above is what happens between Steps 14 and 15. During this time, the colorimeter measures a series of color blocks that appear beneath it. The measurements are compared against the color blocks' true values so that adjustments to the monitor's color profile can be determined. This process used to take a long time (up to 10 minutes), but now it only takes about 2 minutes. If you've used previous Datacolor calibration sensors, the SpyderX calibration process will seem to fly by. In Steps 16 and 17, a new calibrated monitor ICC profile is saved. This new profile will be used whenever the SpyderX software is loaded, such as with startup. I use the display model as my ICC profile naming convention, and I usually set the reminder for 30 days (although I left the "2 weeks" option selected when creating the screenshot). Steps 18 and 19 give you an after/before view so you can see the difference the calibration process has made. Notice the slight shift in the color patches and the overall warmer tones in the calibrated view (Step 18). The final step (screenshots 20 & 21) provides you analysis results pertaining to the capability of your display. I am currently using an NEC MultiSync PA272W 27" 16:9 IPS Monitor. This grade of NEC display is an excellent choice for critical imaging. 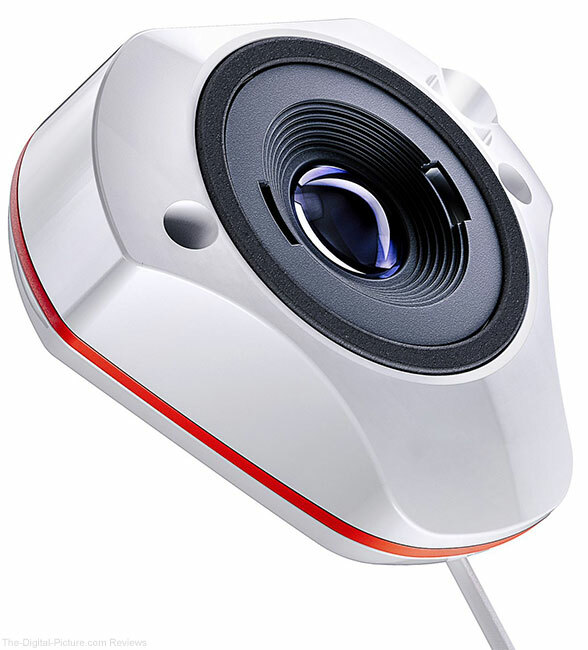 SpyderX Pro is ideal for serious photographers who want control over color management, offering ambient light measurement, and the ability to calibrate multiple devices. 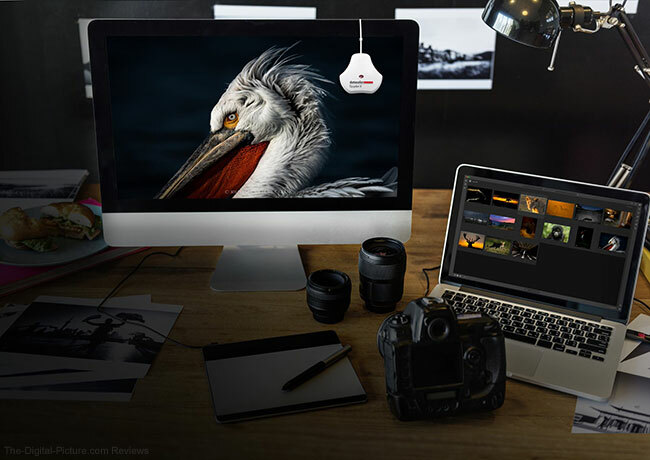 Advanced-featured monitor calibration for desktops and laptops, designed for serious photographers and designers seeking control within their color workflow. SpyderX Elite offers the highest level of customization. 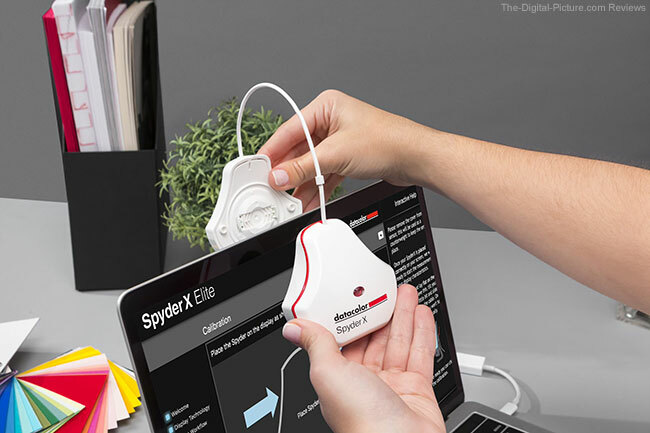 Developed for professional photographers and others who must match colors in extremely fine detail, the SpyderX Elite enables users greater analysis of display quality and the ability to calibrate a wider arrange of devices (as well as match calibration across different devices) with even finer adjustments available. 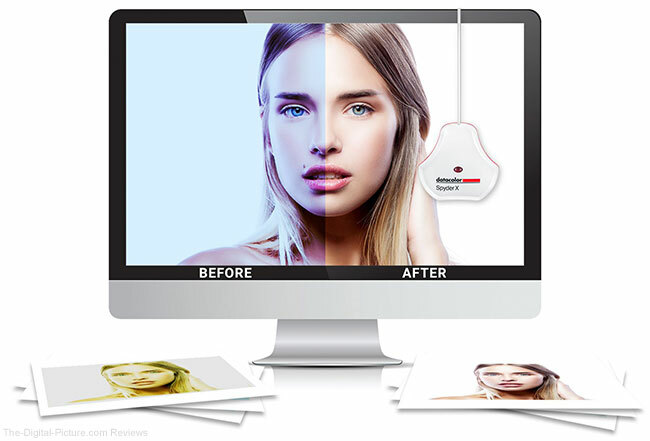 Full-featured, expert monitor calibration for desktops, laptops and projectors, designed for professional photographers and videographers seeking ultimate control within their color workflow. Both are the fastest, most accurate, easiest-to-use Spyder ever. The table below provides greater detail as to the differences between the SpyderX Pro and Elite models. As I said at the end of the Datacolor Spyder4 review (sorry, I never got around to posting a Spyder5 review), you can spend a great deal of time post-processing your images to perfection, but if you are not working on a calibrated display, you might be wasting your time – or worse, you could be adjusting your images to be incorrect. With the Datacolor SpyderX, calibrating a display is both easy and fast, giving you confidence in your photography workflow, allowing you to concentrate on making great images.